At some point in every home or business owner's life, they will experience a clogged drain. Your kitchen drain might be clogged with grease or food, your shower drain might be full of hair and soap, or your toilet could have paper and other objects in it. If you are experiencing sewage back-up through your toilet or other drains, you could even have a main sewer line clog. More often than not, this is a problem that requires a professional plumber to run a plumber's snake through the line in order to unclog it. When a simple plunger doesn't do the job, call a professional, local plumber that you can rely on to take care of those difficult to unclog drains. Robo Plumbing specializes in unclogging even the toughest of clogged drains. Our Bakersfield plumbing technicians have years of experience in offering cost-effective, reliable, and fast plumbing services to customers in all of Kern county. Don't waste your time and money buying drain products that are shown to be ineffective and sometimes even harmful to your drains, rely on a plumbing company in Bakersfield that has spent that last 20 years servicing Bakersfield, CA. We are available 24/7, call (661)323-6000 today for a free estimate! 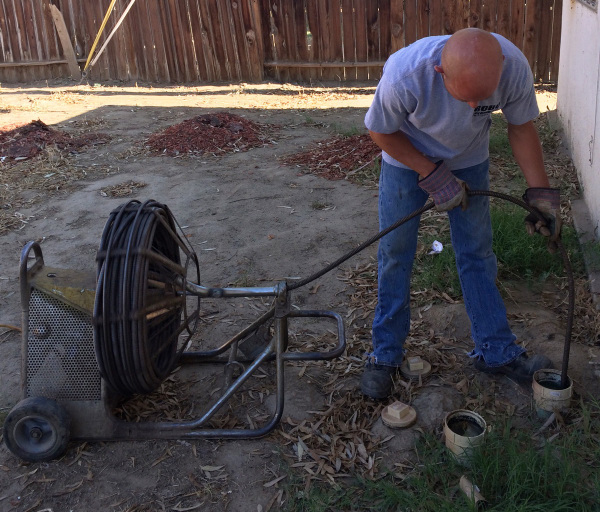 Interested in Drain and Sewer Line Services? We specialize in clearing out drain clogs and providing long term solutions to damaged drains. Toilets, Kitchen, Bathroom, and Laundry Sinks, Bathtubs, Showers, and More!